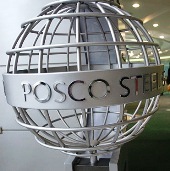 After a two day break, the Orissa government on Monday resumed the land acquisition process for the Rs 52,000-crore (Rs 520 billion) Posco mega steel plant in Jagatsinghpur district. "Land acquisition, which remained suspended on Saturday and yesterday, resumed peacefully today," additional district magistrate (Paradip) Sarojkant Choudhury said. Over a dozen betel vine plantations at Polanga and Noliasahi areas were acquired since morning and compensation paid, he said. Members of the United Action Committee, who had gone dharna at Gada Kujanga last week demanding fulfilment of their demands, decided to cooperate with the administration. Rout hoped that most of their major demands like hike in compensation and jobs to affected families would be considered favourably at the meeting convened by the revenue divisional commissioner on May 30. Though UAC gave up its brief opposition, traditional opponents of the Posco project -- Posco Pratirodh Sangram Samiti and the Bhitamati Suraksha Manch -- have stuck to their stand. PPSS members staged protests at Dhinkia and Gobindpur and that of the BMSM put up a blockade near Nuagaon. Security was tight for the land acquisition with 700 policemen deployed in the area.